How Much Does Medical Transcriptionist Make per Year? A medical transcriptionist converts voice recordings by physicians and other healthcare providers into text format for patient records. Annual earnings for medical transcriptionists in the US are over $38,000 compared to NZ$53,000 ($36,187 USD) in New Zealand, C$42,000 ($32,265 USD) in Canada, and £25,000 ($29,057 USD) in the UK. Among the countries reviewed in this guide, annual salaries in Australia are on the high end at AU$63,000 ($47,798 USD) while South Africa and India are on the lower end at R120,000 ($8,791 USD) and Rs166,000 ($2,580 USD), respectively. Salaries for medical transcriptionists vary by geographic region, work experience, and work setting as further explained in this guide. Medical transcriptionist salaries from select countries worldwide are found in the chart below. Earning potential for medical transcriptionists varies by geographic region, experience, and work setting. This guide explains the effect of these factors as well as career information for this position. In the US, medical transcriptionists earn well over $38,000 per year, or $18 per hour, plus another $600 in bonus income potential. When beginning as a new medical transcriptionist, annual salary reaches $29,000 compared to senior level positions with an average pay of about $46,000 per year. As a medical transcriptionist in Canada, annual earnings can reach C$42,000 per year, or C$20 per hour. Bonus income can potentially add another $700 in additional earnings. Entry level positions garner an average annual salary of more than C$31,000 while senior level positions offer salaries in excess of C$50,000 annually. Medical transcriptionists in the UK earn about £25,000 per year, equating to £12 per hour. There are limited opportunities for bonus pay, but an additional £400 is possible. The average starting salary for entry level positions exceeds £18,000 per year while senior level pay approaches £30,000 annually. In Australia, medical transcriptionists see annual earnings averaging AU$63,000, with another AU$1,000 possible in bonus income. Those paid an hourly wage receive an average of AU$30 per hour. Those early in their career can expect an average starting salary of more than AU$47,000 per year, increasing with experience to about AU$76,000 per year at the senior level. Medical transcriptionists in New Zealand see an average compensation of about NZ$53,000 per year plus nother NZ$800 or more in bonus pay. Those paid an hourly wage receive $25 per hour, on average. Entry level positions garner an average starting salary of about NZ$40,000 per year compared to senior level pay that reaches NZ$64,000 annually. In India, medical transcriptionists earn more than Rs166,000 per year, or Rs80 per hour, and bonus income can add another Rs2,600 in additional pay. The average entry level salary exceeds Rs127,000 per year compared to senior level pay that can reach nearly Rs204,000 annually. As a medical transcriptionist in South Africa, annual earnings average R120,000 per year, equating to an hourly wage of R58. There are some opportunities for bonus pay that can reach R2,000 in additional income. At the entry level, the average starting salary is well over R91,000 per year, increasing to about R146,000 annually for those at the senior level. Regardless of geographic location or salary level, earning potential for medical transcriptionists increases between 59% and 62% with additional experience. In the US, where earnings are among the highest worldwide, senior level pay is about $17,000 more per year over entry level pay, an increase of 59%. Despite lower salaries in South Africa, annual earnings increase R55,000, or 60%, for senior level positions. The greatest increase rate is seen in Australia where the difference between entry level and senior level pay is 62%, equating to AU$29,000 per year. Medical transcriptionists work in physician offices, hospitals, clinics, and some are self-employed. Those who are self-employed may have greater flexibility and the ability to accept more work, leading to higher earning potential. Nonprofit and public-sector organizations may offer lower salaries and fewer bonus incentives compared to for-profit and private sector organizations. While many medical transcriptionists work full-time hours with occasional overtime needs, there are ample opportunities for part-time employment. Typical work hours are Monday through Friday during normal business hours; however, those who are self-employed may have more flexibility in their schedule. A typical benefits package includes healthcare coverage and paid time off for vacations, holidays, and sick time. While some employers offer bonus incentives, these payments are often small and will not significantly impact overall pay. Self-employed medical transcriptionists are often responsible for the expenses of their own benefits, and part-time employees may be ineligible for benefits or bonus payments. 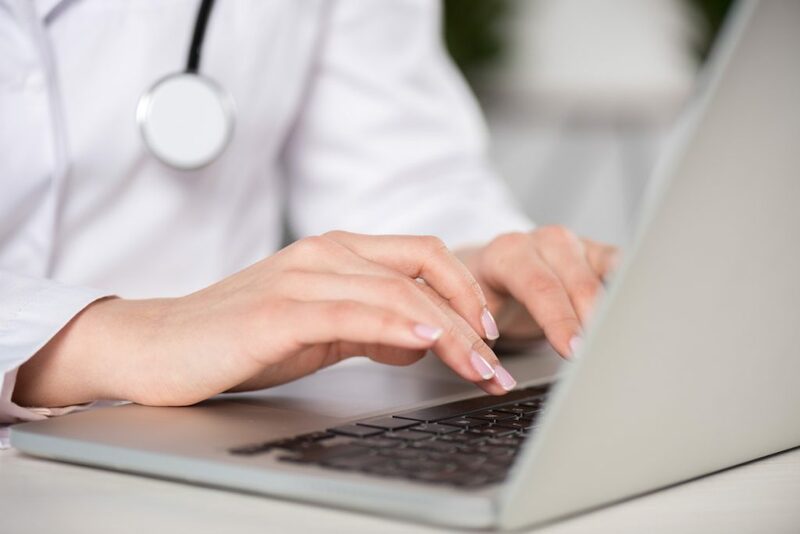 The US Bureau of Labor Statistics estimates an increase of 13% among medical records and health information technician positions, including medical transcriptionists, through 2026. This is a faster than average growth rate and comes as a result of more people accessing medical care and treatment. To work as a medical transcriptionist, there is no minimum educational requirements, but those who complete a certification program may be more competitive for employment. Medical transcriptionists earn less than many other healthcare positions, but the lower income is reflective of the minimal training and education needs for this career field. While many work full-time, there are opportunities for part-time employment and some enjoy flexibility through self-employment. The future of this career field is expected experience growth in the coming years and offer additional employment opportunities.